But by all indications, interest in vegetarianism, of which veganism is a part, is growing.1 It may increase even more with the release of the 2010 U.S. Dietary Guidelines, which for the first time may be placing a major emphasis on the importance of consuming a plant-based diet. 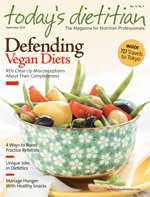 The position of the American Dietetic Association is that appropriately planned vegan diets are healthful and nutritionally adequate and may provide health benefits in the prevention and treatment of certain diseases.2 But among both the general public and professionals, many questions and misconceptions linger regarding what it means to be a vegan. Today’s Dietitian reached out to RDs (and some vegan RDs) to help shed light on these questions and clear up common misconceptions. Why Might One Choose to Go Vegan? Most people who make the decision to go vegan are dedicated to the lifestyle, many with almost religious fervor. That’s because veganism is not always just about nutrition; it’s often a belief system, a way of life. While there’s no hard data, according to Dina Aronson, MS, RD, president of Welltech Solutions in Montclair, N.J., who has been a vegan for almost 20 years, most vegetarians choose the diet and lifestyle for health reasons. Based on Aronson’s personal observations, most vegans choose the diet and lifestyle for ethical reasons due to concerns for animal welfare. How Complex Is the Diet and Lifestyle? Vegan diets are a couple of notches higher on the complexity scale than the notion of simply “eating more plant foods.” They require more planning and discipline, according to most of the dietitians interviewed for this article. However, more grocery items designed for vegans are appearing on supermarket shelves, more restaurants are offering vegan menu items, and even vegan restaurant chains, such as California-based Native Foods Café, are becoming more common. All this makes following a vegan diet much easier than it was in the past. Among the new grocery items are convenience foods. “Convenience vegan foods have experienced phenomenal growth in the past decade or so, making it much easier to be a vegan than it was 20 or 30 years ago,” says Virginia Messina, MPH, RD, nutrition consultant in Port Townsend, Wash., and a vegan for 20 years. How Does It Compare With Omnivore and Vegetarian Diets? Nancy Rodriguez, PhD, RD, a professor of nutrition sciences at the University of Connecticut and protein expert, says vegans should aim to consume 80 to 100 g of good-quality vegetable protein from foods such as soy, nuts, legumes, and cereals and distribute it throughout the day. While some textbooks are still teaching that vegans must complement essential amino acids (EAA) at each meal, Rodriguez says as long as they consume EAA from a variety of sources throughout the day, complementing amino acids is not necessary. As for research comparing vegetarians and vegans, there is not much. “But there’s more than there used to be,” says Mangels. More research is needed to uncover any potential health benefits of a vegan diet, but the small number of vegans in the United States makes studies difficult to design. Can Children Forgo Animal Products? “Many dietitians believe that vegan diets are not appropriate for children,” Messina says, “but vegan diets are appropriate at all stages of life.” The only potential issue regarding children, she says, is if fiber intake is so high that it results in a feeling of fullness that restricts calorie intake. She says the remedy for this is relatively simple: a compromise of higher-fat foods and refined cereals to increase calories. How Can Vegans Avoid Nutrient Deficiencies? Misconceptions exist even within the vegan community. Chief among them is the belief that vegans do not need a supplemental source of vitamin B12. All vegans need to either take a vitamin B12 supplement or consume foods fortified with vitamin B12. The flip side of these potentially harmful misconceptions, says Mangels, is that there is sometimes a misconception that vegan diets are a magic bullet against disease. It can be a healthful diet, she says, but a vegan diet is no cure-all. Most vegans, she says, simply believe that vegan diets are an ethical choice that fits their lifestyle, and it also happens to be a healthful dietary choice. How Can RDs Best Counsel These Individuals? While seeking help from an RD would generally be the best advice for those needing help with diet planning, there seems to be a general consensus among vegan dietitians and even among nonvegan RDs that most of these professionals are ill equipped to provide nutrition counseling to vegans. It’s not a criticism, they say; it’s a matter of exposure and education. “Most nutrition textbooks have very limited information on veganism,” says Mangels. In addition, nutrition curriculums typically offer few counseling techniques for vegans. An analogous situation, she says, is that as a counseling dietitian, you may see only one person with maple syrup urine disease in your lifetime for which you’re ill prepared to provide counseling. The same is true for counseling vegans. “Most RDs will see only a small number of vegans in their entire careers,” she says. If you do counsel vegans, keeping up-to-date with changing ingredients in foods and supplements is key. According to Messina, some products, such as veggie burgers that used to be vegan, now add eggs and dairy. It’s easy to dispense incorrect dietary advice. Andrea Giancoli, MPH, RD, a California-based spokesperson for the American Dietetic Association, is what she calls a “pesca-vegan.” She eats fish but no meat, eggs, or dairy. RDs, she says, are like all other health professionals: They tend to specialize. While she says most dietitians are well equipped to counsel for vegetarian diets, RDs must educate themselves more before counseling clients or patients on vegan diets. Giancoli says it’s also important to find out why a client wants to begin a vegan diet: “People choose their diets for a variety of reasons. Sometimes those reasons are different than what you might assume as an RD, and it’s our job to get to the bottom of that and be sensitive to those reasons in order to better counsel them.” She says the reasons can range from personal food preferences to recommendations from friends or relatives to deep concerns over animal welfare. Learning clients’ reasons behind their desire to change their diet can provide clues as to their level of motivation and the kind of nutrition education they may need. Rodriguez, who is also director of sports nutrition at the University of Connecticut, says she has counseled vegan athletes and that managing their diets can be accomplished with minor adjustments. But, she says, it’s important to keep in mind that vegan athletes are generally educated about their diets, extremely motivated, and compliant. Yet not all vegan clients may demonstrate the same willingness to follow nutrition recommendations. While vegan diets, if properly planned, are safe, nutritious, and healthful, just like poorly planned omnivore diets they can lead to health problems if followers make poor food choices. — Densie Webb, PhD, RD, is a freelance writer, editor, and industry consultant based in Austin, Tex. To avoid a vitamin B12 deficiency, all vegans must regularly consume vitamin B12-fortified foods (eg, fortified breakfast cereals, soy milk, vegetarian meat analogs, energy or snack bars, soy powders or other beverage mixes) or take a daily vitamin B12 supplement. Vegans should not consider fermented soy products, leafy vegetables, or seaweed to be reliable sources of active vitamin B12. Although it is possible to consume adequate calcium from plant foods, it can be difficult. Eight or more servings of calcium-rich plant foods and calcium-fortified foods are recommended. To ensure adequate calcium in the diet, vegans should regularly consume calcium-fortified foods and/or calcium supplements to meet the Recommended Dietary Allowance. To ensure adequate vitamin D status—especially during the winter months, for older adults, and for those who live in northern latitudes—vegans must regularly consume vitamin D-fortified foods such as soy milk, rice milk, orange juice, breakfast cereals, and margarines. Supplements of vitamin D3 may also be necessary if vitamin D blood levels are low. Vegans should consume two servings per day of plant foods naturally rich in the omega-3 fatty acid alpha-linolenic acid, such as ground flaxseed, walnuts, canola oil, soy products, and hemp seed-based beverages. Though more research is needed in this area, fortification or supplementation is likely necessary only for those with a family history of conditions linked to low levels of omega-3s, such as heart disease, macular degeneration, or depression. — Author compiled recommendations using reference 3 and Messina V, Melina V, Mangels AR. A new food guide for North American vegetarians. J Am Diet Assoc. 2003;103(6):771-775. 3. Craig WJ. Health effects of vegan diets. Am J Clin Nutr. 2009;89(5):1627S-1633S. 4. Davey GK, Spencer EA, Appleby PN, et al. EPIC-Oxford: Lifestyle characteristics and nutrient intakes in a cohort of 33,883 meat-eaters and 31,546 non meat-eaters in the UK. Public Health Nutr. 2003;6(3):259-269. 6. Fraser GE. Vegetarian diets: What do we know of their effects on common chronic diseases? Am J Clin Nutr. 2009;89(5):1607S-1612S. 7. Spencer EA, Appleby PN, Davey GK, Key TJ. Diet and body mass index in 38,000 EPIC-Oxford meat-eaters, fish-eaters, vegetarians and vegans. Int J Obes Relat Metab Disord. 2003;27(6):728-734. 8. Toohey ML, Harris MA, DeWitt W. Cardiovascular disease risk factors are lower in African-American vegans compared to lacto-ovo-vegetarians. J Am Coll Nutr. 1998;17(5):425-434. 9. Barnard ND, Cohen J, Jenkins DJ, et al. A low-fat vegan diet improves glycemic control and cardiovascular risk factors in a randomized clinical trial in individuals with type 2 diabetes. Diabetes Care. 2006;29(8):1777-1783. 10. Appleby P, Roddam A, Allen N, Key T. Comparative fracture risk in vegetarians and nonvegetarians in EPIC-Oxford. Eur J Clin Nutr. 2007;61(12):1400-1406.